The need for creative solutions to fund long-term conservation has never been greater. Increasingly, new mechanisms to fund conservation will be required to leverage dollars. As we explore new conservation tools – conservation credits, mitigation banking, payment for ecosystem services, markets, and more – there is a growing need in Wyoming and beyond to better understand these options. This forum will build an informational foundation about a range of conservation finance tools, both established and emerging. Speakers will share real-world applications, success stories, and challenges using various conservation finance models in government and the private sector to inspire further practice of conservation finance in Wyoming. 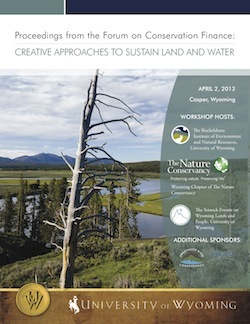 The April 2013 Wyoming Forum on Conservation Finance: Creative Approaches to Sustain Land and Water presentations and proceedings are now available online. Learn why we need conservation finance, the basic tools and structures of conservation financing, and some of the emerging approaches to leverage private and public funds for conservation. The Tuesday, April 2, agenda included presentations and panel discussions covering the purpose of conservation finance, tools and structures, lessons from water markets, and public-private partnership lessons from Wyoming. On Wednesday, April 3, participants toured a proposed mitigation bank on the Pathfinder Ranch near Alcova. The Ruckelshaus Institute, supporting stakeholder-driven solutions to complex environmental and natural resources challenges by communicating relevant research and promoting collaborative decision making. The Stroock Forum on Wyoming Lands and People, creating open dialogue between private citizens and public policy makers about the future of economic development and environmental quality in Wyoming and the West. The Nature Conservancy, protecting the lands and waters that make Wyoming the place we love to play, work and live. Encana Oil and Gas (USA) Inc. If you have questions, feel free to contact the Ruckelshaus Institute at ruckelshaus@uwyo.edu or (307) 766-5080.